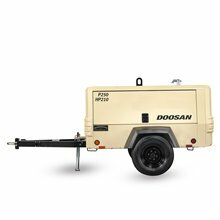 The P250/HP210-T4F portable air compressor is powered by a Tier 4F compliant Doosan D24 turbo diesel engine. To maximize jobsite productivity, the P250/HP210 has been engineered with DOC emissions technology and zero-maintenance engine after treatment. Doosan Portable Power has designed the P250/HP210 air compressor with versatility and operator convenience in mind. The air compressor can operate in dual compression modes, 250 cfm at 100 psi or 210 cfm at 150 psi, each mode offering eight-hour runtime at 100 percent load.